Take your style to the next level with a beautifully proportioned tapered zigzag solid turned wood table, further enhanced by cracks inherent to the wood. Simply sculptural and perfect for elegant perching of drinks or guests indoors or out. 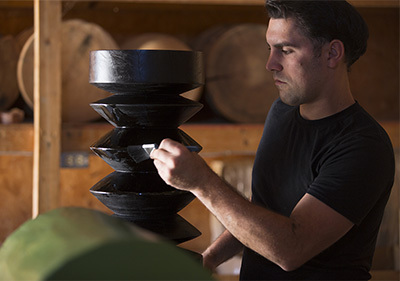 Artisans turn solid Margosa – a dense tropical wood – on a lathe, shaping and sanding by hand. Your piece will be finished per your specifications. How we would use it | A few in various finishes scattered about for drinks tables or seating.